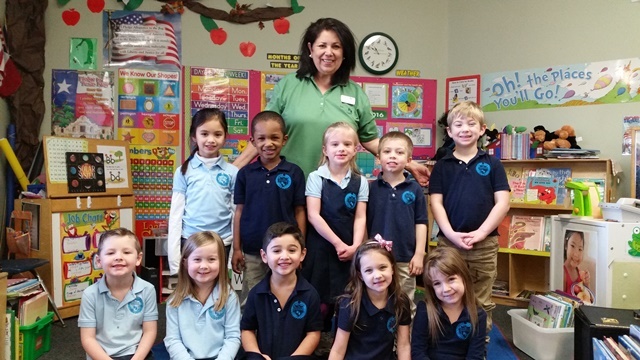 Ms. Irma, Lead Accelerated Pre-Kindergarten teacher at The Children’s Courtyard in Keller, TX, has taught at CCY for nearly 15 years! Read our Q&A with this incredible staff member to learn more about her exciting classroom, why she chose a career in early education and her love and dedication to each of her students. Why did you decide to become teacher in early childhood education? It’s all I ever wanted to do. I was one of those students whose parents didn’t have time for me, and I struggled with reading and writing. I thought, if I ever have a child, she will be no means have this issue. I tutor kids in my neighborhood just to help them excel in school. My daughter graduated fourth in her class, full scholarship. I like working with the kids. I want to help them excel. What do you love so much about teaching four- and five-year-olds? I love that they’re at this age where the teacher has a huge responsibility to get the students better prepared for the next school year. Once we set that foundation, that’s it. We’ve done our part. We’ve built up their confidence. They will skyrocket. Can you describe some of the lessons you teach in your classroom? My students right now, most of them just turned five and they are already reading and writing not only at a kindergarten level, but some also at first grade and second grade levels. At the beginning of the school year we learned about germs, blood cells, platelets, good bacteria and bad bacteria. And we made fake blood! One of the things right now that we’re talking about is the moon, so the director is allowing me to do a whole lesson on the solar system! We’re getting ready to do a spaceship lesson next week! A big part of our program is that we encourage student-led activities and lessons. How do you maintain that flexibility in your classroom? I have books in bins throughout the classroom, and they have bookmarks in them. 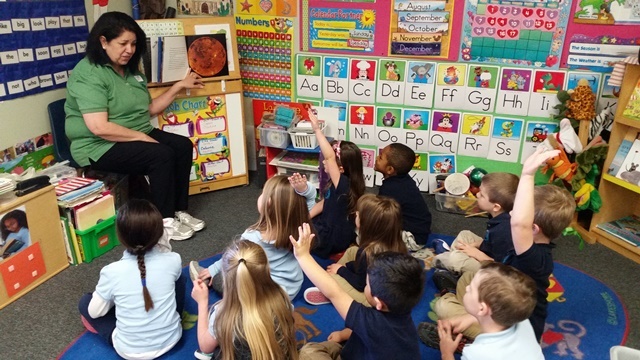 I’ll say, “go ahead to circle time, I’ll be right there,” and they say, “Can we look at a book?” So I say, “Of course you may look at a book!” They sit down and then they’ll put their bookmark on a particular page and they’ll put it by my chair where I have another basket. When we’re getting ready right before lunch or if it’s after lunch and we need to calm ourselves, I’ll pick up the book and open up the page and ask, “Who picked this page?” A student will say “I did!” Then I’ll say, “What is it you want to know?” We touch on a variety of things, so many things. Do you do anything special for graduation at the end of the year? I take pictures throughout the school year and I do a slideshow at the end of the school year for graduation. The parents get a copy, too. I do a picture of before and after from when they were a baby to now, with their graduation cap and gown. I also do an awards night that night! How do you keep communication open between you and the parents? They talk to me all the time. I’m there for them. I come in a little early, I stay a little late. I’m here. I tell them they’re welcome to observe any time; you don’t have to ask me. I did have one parent several years ago say she was spying on the class from across the parking lot and looking with her binoculars! She said, “Ms. Irma, I’m so happy to have my daughter in your class. I didn’t know what to do because my daughter, nobody wants her in their schools, and that’s why I was concerned. They told me about you, and I said I’d give it a try.” Her daughter has changed so much since being here! It sounds like you leave a lasting impression on your students and families! I promise the parents that I would give my life in the blink of an eye for their child. They love me and I love that. We’re a class family. I’ll be at the school playground and the director will bring me some visiting former students who are now 17! Of course I remember them! They say, “We love you Ms. Irma!” I’m happy and I’m thankful for my job. Honestly, this is not work for me. This is fun.